· Magnetic bubble level: Perfect positioning is guaranteed by removable magnetic bubble level. 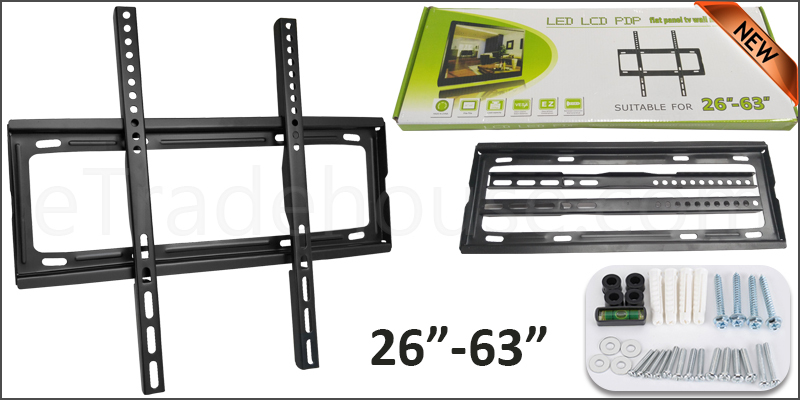 · Universal Hole Pattern: Random hole pattern and side to side adjustment allow mount to fit nearly all flat panel TVs. connected to the wall mounting plate, so you don’t have to worry about accidentally knocking off the TV from the wall. · Low-profile design ensures TV is close to the wall for a sleek finish. Open plate design assures easy access to back of the TV and cables. Supported VESA Sizes: 200x200mm, 200X400mm,300x300mm, & 400x400mm. 1. All TV Wall Brackets should be installed on concrete wall, solid brick wall and solid wood wall. Do not install on hollow and floppy walls. 2. Tighten the screw so that wall plate is firmly nattached, but do not over tighten. Over tightening can damage the screws,reducing their holding power. 3. Do not remove screw or loosen screw from your TV Screen until it is no longer engaged with the mount. Doing so may cause the screen to fall. 4. All TV Wall mounts should be installed by trained installer specialist.